‘Domino’ printed paper is decorated paper, the patterns having been printed using a woodblock with colour applied using a paintbrush or stencil. 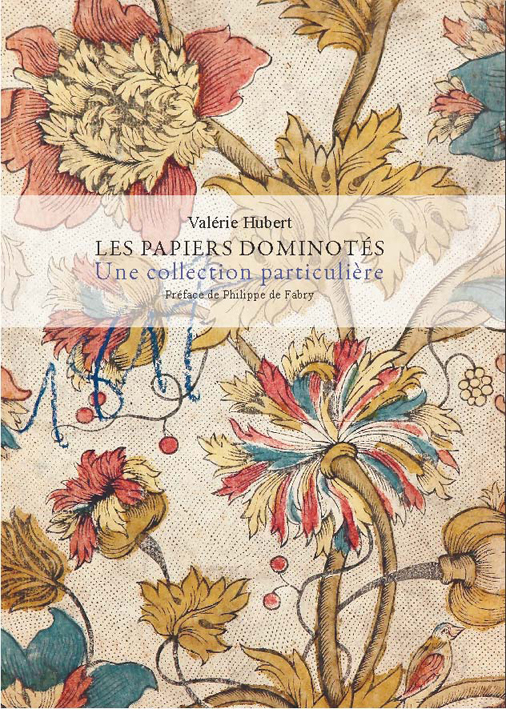 In France, these sheets of paper decorated with geometric or floral patterns peaked in popularity during the second half of the XVIIIth century. 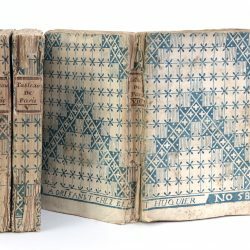 At the same time, other countries also had their own specific printing methods and were making their mark printing substantial volumes of decorated paper. Germany favoured the copper-plate printing method that produced ‘gold embossed’ paper. 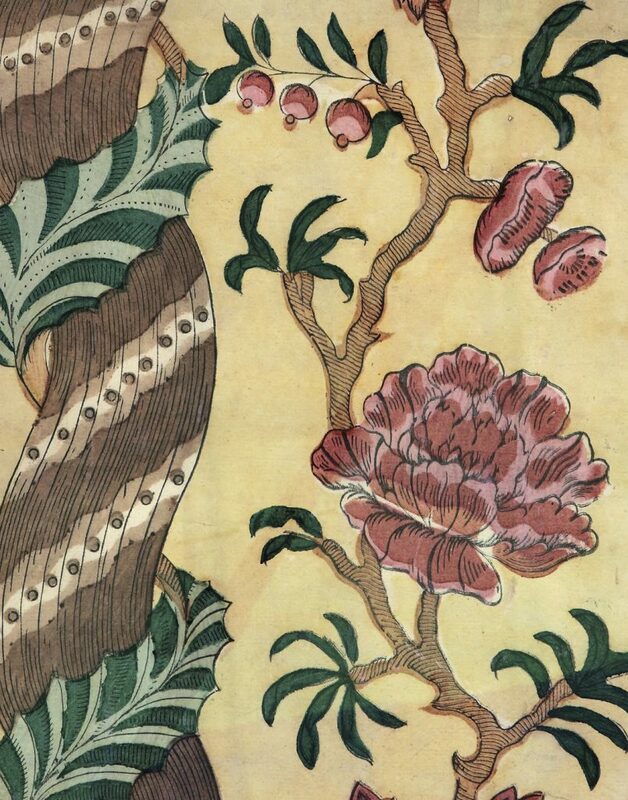 Italy used a method that employed several woodblocks, producing very intricate, richly coloured paper. 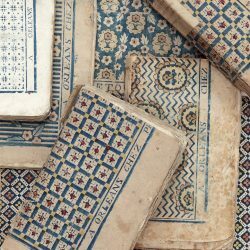 ‘Domino’ printed paper was produced by artisan ‘dominotiers’ – craftsmen who sometimes also made playing cards (cartiers) or produced images (fabricants d’images). 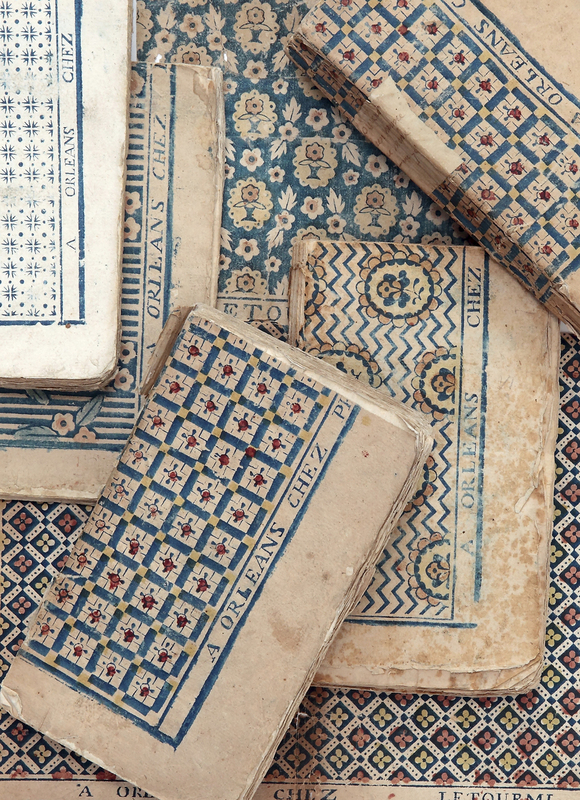 The history of making ‘domino’ printed paper is complex. Dominotiers are mentioned very early on in history. In 1540 they became part of the guild of « playing card makers, paper leaf makers, master dominotiers printers of history », but when exactly did dominotiers start producing pattered paper? There’s a blurry line between the crafts of printer, illustrator, dominotier, playing card maker, image maker etc, and documents are too scarce on the ground to tell them apart. 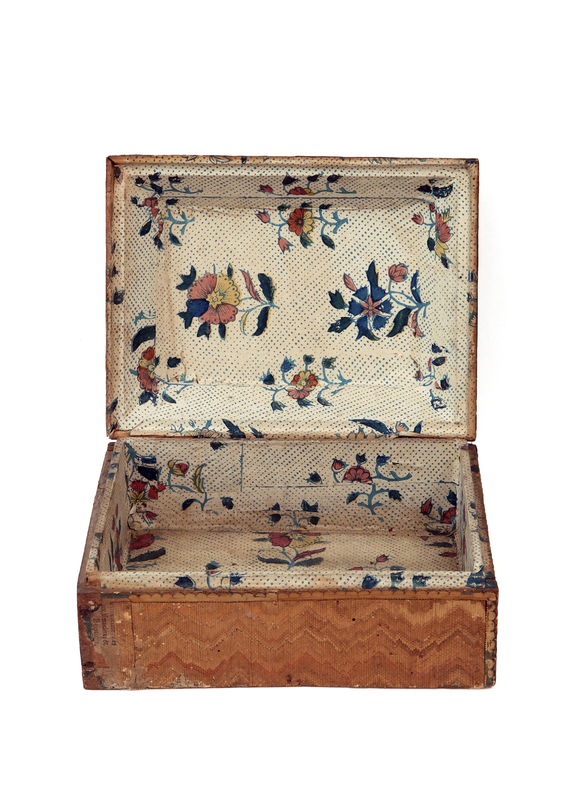 ‘Domino’printed paper was used to decorate the interiors of boxes, drawers and small items of furniture. 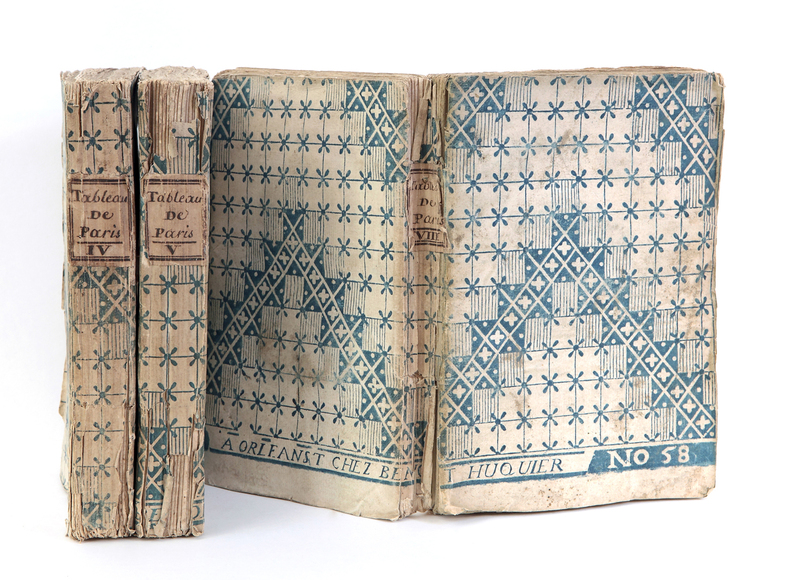 They were used mainly for covering books and brochures. 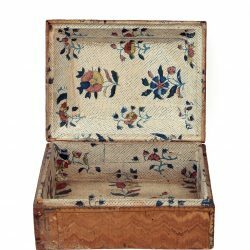 Printed paper with large floral patterns tended to reproduce patterns from brocade, Cordoba leather and Indian fabrics. They were designed as wallpaper. Assembled side by side, they produced a continuous, repetitive pattern. At that time the word wallpaper was not yet used, rather “wall hanging” or “tapestry paper”. Dominotiers set up their workshops all over France. 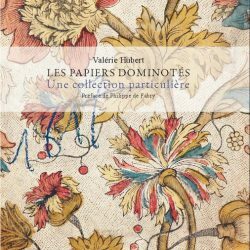 Paris, Chartres, Le Mans and Orleans were the most important production centres for popular images and decorated printed paper at the time. Designs from Orleans still predominate in all collections. The workshop of a dominotier is small in size, often organised as a small family-style set up. The dominotier engraves the wood stencil himself or calls upon the skills of an artisan engraver. The woodblock print is dabbed with a « frotton » on a sheet of paper in so-called « crown » format (dimensions approx 45 x 36 cms). Colour, composed of natural pigments and gum Arabic, is then added by hand or using a stencil. The sheet has its name, the town where it was made, and a number written on the edge of the sheet. ‘Domino’ printed paper was printed in thousands of copies by the craftsman. They were distributed in bulk quantities and sold cheaply. These fragile prints, destined for short term use, were not highly regarded due to their popularity but they are now rare. They have not completely disappeared into oblivion however. In recent years a clutch of historians, collectors and artisans have brought the art back to life.